An elderly woman presents to her doctor feeling unwell. her facial appearance is shown below. 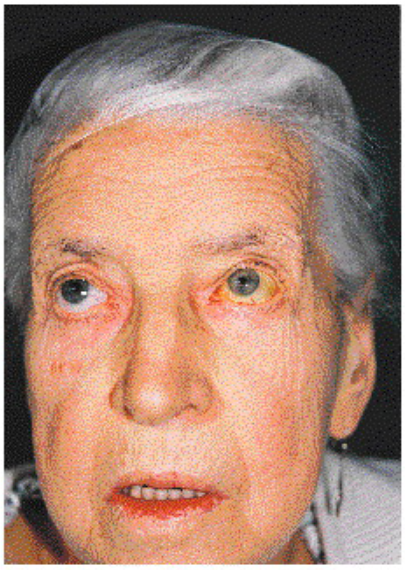 The patient has one normal and jaundiced eye. what is your interpretation of this abnormality? The patient has an artificial eye (the normal one) and a normal eye (the jaundiced one). how did this occur? Diagnoses please! The patient had an enucleation for melanoma of the eye which has now recurred with liver metastases - its favoured metastatic site. N Engl J Med 1997; 336:846 March 20, 1997.